The Prince George’s County Council Zoning Ordinance Rewrite Web Portal has been updated to include a proposed “Zone Conversion Table”, a conversion guide from current to proposed zones in the Proposed Zoning Ordinance. Please continue to check the portal for updates and share your comments with the Council. The next scheduled work session on the Zoning Ordinance Rewrite is scheduled for Tuesday, July 10 at 7:00 p.m., in the Council Hearing Room, First Floor, County Administration Building, 14741 Gov. Oden Bowie Drive, in Upper Marlboro. Council Chair Dannielle Glaros was among County leadership participating in an historic forum focusing on transformative change in the health and well-being of all County residents on Thursday, June 7th. The event, which took place at the College Park Airport Operations Building, was hosted by the Prince George’s County Healthcare Action Coalition, chaired by Prince George’s County Health Officer Pamela B. Creekmur. More than 80 state and local elected officials and agency representatives, leaders in the medical and business communities, as well as the CEO’s of each Federally Qualified Health Center in the County, gathered for this first in a series of first of several health equity forums planned in the County. “COUNCIL CONNECTION-TOGETHER STRENGTHENING OUR COMMUNITIES,” is now airing on Prince George’s Community Television, an award–winning, nonprofit cable access facility serving as the media hub of information in Prince George’s County since 1989. The program is a production of the Prince George’s County Council, hosted by Council Chair Dannielle Glaros. The current edition focuses on healthcare in Prince George’s County, with guests Dr. Joseph Wright, the Council’s Board of Health Consultant, and Dr. Michelle Gourdine, Senior Vice President of Population Health and Primary Care, University of Maryland Medical System. For programming information, visit www.pgctv.org or click HERE to watch! The Prince George’s County Council was represented at the annual Maryland Municipal League Summer Conference, “Learn, Engage, Access, Deliver” in Ocean City, Maryland, June 10-13, 2018. During the conference, local officials learn about and discuss municipal issues and network with fellow colleagues. The Maryland Municipal League is a tax exempt, nonpartisan association. 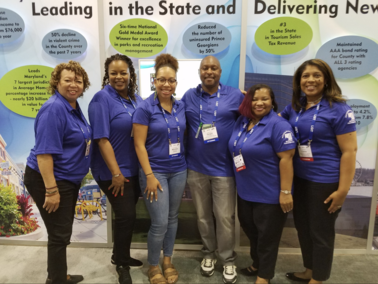 Pictured left to right are the Clerk of the Council Ree Floyd, and Deputy Clerk of the Council Donna Brown, with other officials Prince George’s County Government and the Maryland-National Capital Park and Planning Commission, standing in front of the County’s MML 2018 Booth Exhibit.